In addition to Chicago Sun-Times report. In major fires, the City of Chicago Department of Water Management provided needed suport. Two Investigator crews responded today, including Patrick McDonough, Ronald Bober, and Al Treadwell. Job well done! 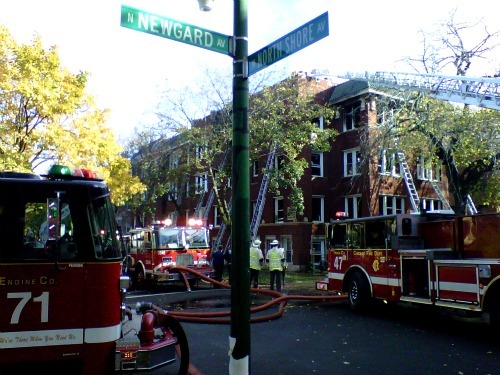 Fifty-five people — including 21 children– were displaced after an extra-alarm fire in a Rogers Park apartment building Sunday afternoon. The Red Cross will open a shelter to provide a safe place for the the 34 adults and 21 children who were displaced, according to a release from the American Red Cross of Greater Chicago. The organization will also provide assistance for food, clothing, seasonal garments and mental health services. The fire was reported at 6655 N. Newgard Ave. in a three-story, 12-unit apartment building at 12:47 p.m., according to Fire Media Affairs spokesman Rich Rosado. The response was raised to a 2-11 alarm at 12:59 p.m., Rosado said. The fire was out at 1:50 p.m. but firefighters on the scene were chasing hotspots, Rosado said. No one was injured and no one needed to be taken to a hospital to be checked out, Rosado said. The fire was on the second and third floors of the building, Rosado said. The building was partially vacant. A 2-11 alarm sends at least eight engines, four trucks, two tower ladders, five battalion chiefs, a district chief, a deputy district chief, a squad company, an ambulance and the Command Van to the scene. Please note, one lady and her daughter provided firefighters, water department investigators, and the homeless folks with sandwiches, paid for out of her own money. This lady that also lives close to the fire, allowed the affected families to use her bathrooms and home. I with they would do a story on her good deeds. We should also thank the Salvation Army and other city agencies for additional support. Photo by Patrick McDonough. To: obsessed w/Daley..that was the point of my comment..pat should stop patting himself on the back just because he arrived on the scene of a fire,accident, ect..he works for water not police or fire..and i agree he should be investigated by the I. G. (Response) Why the heck would the Office of the Inspector General care what I do? I go to work, I am at work, and I do my job. The IG will only start following me if I run for office, Like for Alderman. Previous PostPrevious Mario Olivella, Plumber&apos;s Local 130 best Plumber goes to jail soon. Next PostNext Rahm ready to take over Daley&apos;s scam contract minority deals.